Aberdonians have been pilloried for their alleged meanness by any number of musical hall acts and stand-up comics down the years. But the raft of new charity initiatives launched in recent months – and with others yet to be unveiled in 2019 – shows that people in the north east are among the most committed contributors to good causes anywhere in the world. Whether it is working to create a new Charlie House respite facility, constructing the Anchor Centre, collaborating in an expansion of the amenities for people with severe neurological conditions at Sue Ryder Dee View Court or championing an air ambulance in Aberdeen, it has been estimated that a host of charity organisations in the city are currently involved in trying to raise more than £50 million. Charlie House has just confirmed details of its ‘Big Build Appeal’ – a three-year campaign to raise £8 million for a specialist respite facility. This will support babies, children and young people with complex disabilities and life-limiting conditions and will be built in the grounds of Woodend Hospital in Aberdeen. It will be an eight-bedroom centre, with additional family accommodation, set in four acres of ground and features a sensory room, library, spa pool, craft room, teen den, soft play area, therapy room, a star room for end-of-life care and bereavement, outdoor play area and sensory gardens as well as adaptable meeting space and office space for the Charlie House team and medical staff. The building will be the first of its kind in the north-east of Scotland with families currently having to travel over 100 miles to Kinross to access planned and emergency short breaks, palliative and end-of-life care. The charity launched the scheme with a £1 million fund which has been raised through various events, fundraising and donations and has been restricted for the build project. Tracy Johnstone, chairwoman of Charlie House, said: “We are calling on individuals, groups, schools and local businesses to continue to support this life-changing project. “We are so passionate about bringing this centre to the city. This is about offering families we support choice. Choice as to where their child is cared for and in what type of environment. The range of charity projects encompasses every part of health and care provision, tackling every sort of mental and physical condition. Friends of ANCHOR has just launched its ANCHORED Together Appeal – a campaign to raise £2 million for a purpose-built out-patient and day-patients facility, due to open at Foresterhill in 2021 and serving 65,000 patients a year. Sarah-Jane Hogg, the charity’s fundraising and development director said: “The ANCHOR Centre will, for the first time, bring oncology and haematology patients together in the same treatment space, in a state-of-the-art building that will vastly improve the patient journey for all those going through a diagnosis. “It is a long-awaited addition to ARI and our team is extremely excited to be part of it. The charity’s fundraising will supplement the £32 million building project, to help bring the best possible care, treatment and support for north-east cancer and haematology patients. In another part of the city, construction work is nearing completion at Dee View Court in Kincorth, with Sue Ryder in the final months of its two-year capital appeal to raise £3.9 million to double the size of its Aberdeen-based neurological care centre. The purpose-built care centre is the only one of its kind in Scotland and the demand for specialist residential care and support for people living with complex neurological conditions is increasing. More than £2.5 million has already been amassed to build 20 new bedrooms at the centre and the charity is appealing to the community to help them raise the remaining funds to complete the project next summer. 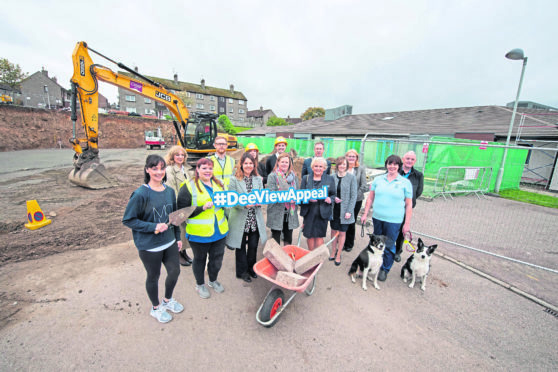 Valerie Maxwell, Dee View Court’s centre director, said yesterday: “We’ve had wonderful support from local businesses, organisations, individuals, and trusts, which gave us the confidence to break ground and begin the building works on the new bedrooms in August this year. The organisation is planning to establish the facility as a centre of excellence in the provision of specialist neurology training and development. They are reaching for the sky. So, too, Scotland’s Charity Air Ambulance recently unveiled the Granite City as the location for its second emergency medical service helicopter and is currently involved in a £6 million drive. It’s an ambitious venture, but the organisation’s decision only came after lengthy talks between SCAA and the Scottish Ambulance Service, in consultation with other key bodies, and there is a discernible urgency among those spearheading the drive. Its chairman, John Bullough, said: “Aberdeen will house one of Scotland’s four major trauma centres in the future Scottish Trauma Network and it makes sense for Helimed 79 to add its considerable capability to that growing hub. The process of transforming so many people’s lives has only just started. But it’s obvious that 2019 will be a year of giving in the Granite City and beyond.